College football and pro baseball fans quickly recognized and connected Kyler Murray as having a choice to make once the Oakland A’s selected him with the ninth pick of last week’s Major League Baseball draft. After all, he’s Oklahoma’s projected starting quarterback – the heir to Heisman Trophy winner Baker Mayfield, who led the traditional gridiron power to the College Football Playoff. But don’t overlook Jordyn Adams, a player who faced similar circumstances once the Los Angeles Angels drafted him eight picks later. Adams wasn’t so well known as a high school athlete, but he had signed a North Carolina football scholarship offer with plans to also play baseball for the Tar Heels. He was rated a four-star prospect and played in the U.S. Army All-American Bowl. Those plans were altered after the Angels called his name as the 17th pick out of Green Hope High in Cary, N.C.
And if we operate on the premise both will someday make it to The Show, Adams might beat Murray to the big leagues despite the lower national profile at this time. Murray is staying behind another year at Oklahoma for football after signing a reported $5 million deal. Adams is jumping into pro baseball this summer after signing for a what was originally reported $3.5 million. Upon signing two weeks later, the deal was reported at $4.1 million -- $627,100 above the slotted value for the No. 17 pick. “Last night I received a blessing that I’ve been working towards for a long time. God has blessed me with a Win Win situation and after talking to my family we have decided that’s its best for me to pursue my professional baseball career. Adams, a 6-foot-2, 175-pounder, is projected to have the speed to play center field and enough power to be an offensive weapon. 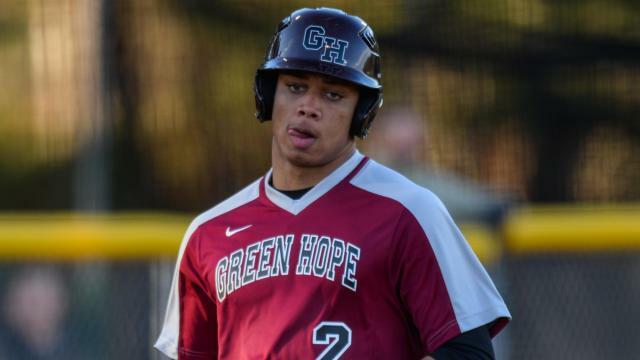 He rapidly gained first-round projections following his senior year that included leading Green Hope to a runner-up finish in the National High School Invitational. The tournament that was played at the USA Baseball Complex, which is located a deep center-field throw from Green Hope campus, draws MLB scouts in droves. Once Green Hope suffered an early exit in the N.C. High School Athletic Association 4A playoffs – the Falcons lost in the first round to eventual state champion Fuquay-Varina – scouts began scheduling discussions. A steady stream visited the family home to talk with him and his parents. He also worked out at Green Hope's field for scouts. Somewhere in those visits the Angels felt confident they could sign Adams. Adams explained his decision to sign in a conference call with reporters. Adams arguably faced a more difficult choice choosing baseball. Murray, as a 5-11, 195-pounder, doesn't have an NFL future as a quarterback. Adams has the frame for an NFL body. Murray drew headlines when the A's drafted him, but there’s nothing new about the rare multi-talented athlete with enough ability to choose between two sports at the next level. But the millions baseball franchises are willing to spend these days seems to have made for quicker decisions. Three prominent athletes that were the first to take advantage of the NCAA rule in the late 1970s and early 1980s allowing college eligibility in one sport and professional status in another were Danny Ainge, Kirk Gibson and John Elway. Ainge played basketball at BYU and baseball in the Toronto Blue Jays organization; Gibson football at Michigan State and baseball with the Detroit Tigers’ farm system; and Elway football at Stanford and baseball with the New York Yankees organization. There’s no way to tell how this tug-and-pull turns out. Ainge ended up an NBA champion with the Boston Celtics, Gibson a World Series champion with the Tigers and Los Angeles Dodgers and Elway a Super Bowl champion with the Denver Broncos. They are three multi-talented athletes that won world championships in three separate sports. But it is reasonable to think Adams has a head start on Murray.